Radical Remedies: What is Detox? 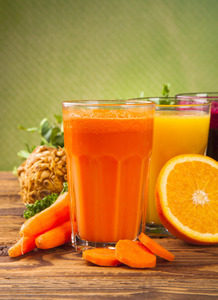 What is detoxification? From a medical point of view, it is the neutralization and excretion of toxic substances from our bodies. Some of the most common sources of these toxic substances are heavy metals in food and water or industrial and/or combustion engine derived pollutants. We either inhale them, consume them in our food or drink, absorb them through our skin, or they are produced as by-products of our metabolism. They are either directly toxic to our cells or cause damage by stimulating the production of free radicals and inflammation. They not only cause cell damage but may also accelerate the aging process and contribute to the development of many unpleasant medical conditions. The most important organ that detoxifies these substances is the liver, but the kidneys also play a very important role in concentrating these substances in the urine and excreting them out of the body. Other means of detox are by excretion through stool, bile and sweat. So how can we help the body to neutralize these harmful substances so that they don’t cause excessive damage to our bodies? One simple way is to live a healthier life. Eat more protein (especially plant derived proteins; our seed blog entries this week provide excellent examples of sources that are not only rich in protein but are also excellent anti-inflammatory food sources packed with health promoting compounds), healthy fats, vegetables, and avoid simple sugars from things like table sugar, soft drinks, chips, white bread and white rice. Exercise on a treadmill or an elliptical machine, take breaks from alcohol consumption and try to stay away from tobacco. But how else can we help our bodies? Here are a few great examples. Berries, greens, and vitamin C are great anti-oxidants which help the body stay clean of toxic substances. Revolutionary super foods such as spirulina and chlorella as well as parsley and cilantro are also excellent. These last four not only bind and help excrete toxins in general but they are also excellent in their ability to bind and help in the excretion of heavy metals. These are very important things to keep in mind especially in our modern industrial world where we are constantly bombarded by impurities in our environment. Of course most of you will agree with me that having a car, electricity, internet, and an almost unlimited supply of consumer products and energy is fantastic. But let’s keep in mind the very important point of staying as green and as energy sufficient as possible in order to keep our planet green and clean. This is of utmost importance for our future and future generations as well as for protecting ourselves from the impurities that surround us. Try some of the tools I mentioned here to help the body in its fight against toxins and work with friends, family and work colleagues to live a greener lifestyle. We can then celebrate the priceless reward of living longer, healthier and happier lives. Categories: Detox, Environment, Lifestyle, Nutrition, Radical Remedies, by Dr. Karol, Superfoods, Weight Management | Tags: detox, detoxification | Permalink. Thank you. I have been blogging for about 2 years now. You can also find my blogs at vitarock.com All the best. put up used to be good. I don’t know who you aree however definitely you’re going to a well-known blogger in case you aren’t already. Thank you. All the best to you, and please return for my future blogs. The first thing is that you need to be knowledgeable on the subject. If you are not then read up online or books/magazines etc. Second thing is you need to be objective. Present the positives and negatives. Do not be biased. Third you need to write well. If you don’t you will need an editor. All the best. for the reason that this this website conations truky fastidious funny information too. Thank you for your comments and your motivational words. All the best to you. say that I’ve really enjoyed browsing your weblog posts. equally educative and engaging, and withhout a doubt, you’ve hit the nail on the head. Thhe problem is something not enough people are speaking intelligently about. I will bookmark your weblog and chec again here frequently.